Transtech is accustomed to working with governmental agencies in every facet of engineering, planning, building, funding and public works. Our staff has an unparalleled understanding of public agency issues, procedures, and policies. In addition, we have worked on multi-million dollar mega projects for a variety of government agencies. 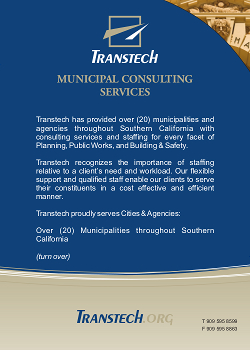 The Transtech team members have served public agencies in various capacities including City Engineer, City Traffic Engineer, Building Official, Project Manager, Planner, and Inspector. The Firm strongly promotes the ability to efficiently work with staff of various government agencies, including Caltrans and Regional Transportation Authorities and Counties, including, but not limited to Riverside County Transportation Commission, Riverside County Economic Development Agency, Los Angeles Metropolitan Transportation Agency, County of Los Angeles, and SCAG. We also work for Universities, such as University of Riverside, Cal State San Bernardino, Cal Poly Pomona. Transtech recognizes the importance of staffing depending on a client’s need and workload. Our flexible support and qualified staff enable our clients to serve their constituents in a cost effective and efficient manner. While our service is always on an “as needed” basis, our responsiveness is on “full-time” basis.